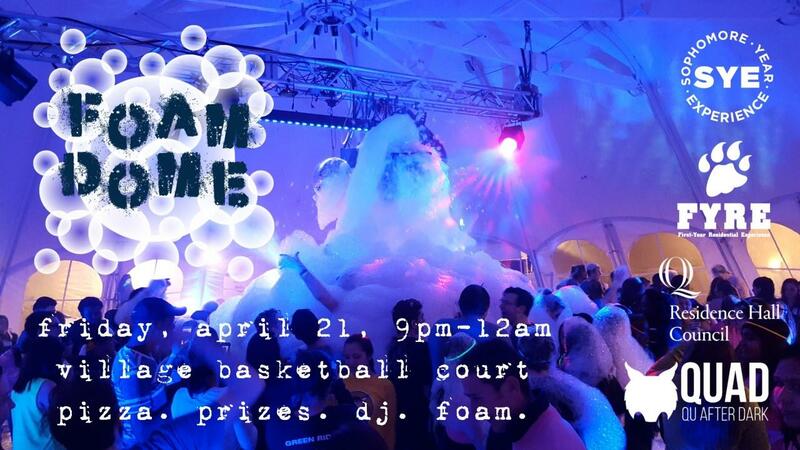 Residence Hall Council (RHC) and QU After Dark (QUAD) are proud to present another annual Foam Dome event. The event will be held this Friday, April 21 from 9 p.m. to midnight. Foam Dome will take place on the basketball court near New Village. The event is open and free to all students. RHC is co-sponsoring the event with Freshman Year Residential Experience (FYRE) and the Sophomore Year Experience (SYE). QUAD is also heavily involved in the planning and execution of the event. Senior marketing major Jaclyn Consoli is part of RHC. Brian Goepfrich and David Ferguson are residence hall directors that are helping to run Foam Dome this year as well. For the past couple years, they have helped with advertisements. Goepfrich and Ferguson act as liaisons between the RAs and RHDs and QUAD. According to Consoli, it has been a constant partnership. According to Consoli, more students attend Foam Dome every year. They are projecting about 500 students to attend this weekend. Emily Eichholtz, a freshman sociology major, is attending Foam Dome for the first time this year. She said she is going because it looks like fun and she has heard great things about the event. “This is the first event I am attending hosted by SPB or QU After Dark. I expect Foam Dome to be a fun time with loud music and good vibes,” she said. This year, QUAD, RHC and other organizations will be giving out more free prizes and gifts, according to Consoli. Refreshments including pizza and popcorn will also be served at the event. RHC just released a promotional video. Although some students had concerns about the safety and cleanliness of the foam last year, Consoli set the record straight. Amanda Evans, a sophomore criminal justice major, attended Foam Dome last year. Although she said she enjoyed it, but she had some suggestions for this year. She said it would be an improvement to hold it as close to the end of the year as possible, so that it is not so cold.